To celebrate the 4th of July, I thought I would check out books from the library, sit down and set to work on drawing some historical costumes for Marisole set in the 18th century since the Revolutionary War (Or, as the Brits call it, the Rebellion of the Colonies) was in the 1770s. I’ve only done one other set of historical costumes for the paper doll and they were regency dresses (One set one in July and one in August in 2010). This is about as far from the Regency aesthetic as you can get- the French Revolution did have a way of changing fashion, also of decapitating an awful lot of people. Those wiley French. So, I’ll confess that when I have to name my favorite periods of historical fashion the 18th century doesn’t get a lot of attention. I’m just not that huge of a fan, but when I was in England I went to the Fashion Museum in Bath and I saw an actual 18th century gown in person. Despite my tendency to dismiss such costumes as too poofy, too over the top, too absurd for my taste, the actual dress was among the most astonishing pieces of craftsmanship I have seen. The frustration of drawing historical costumes for Marisole is that her proportions are so darn strange. While I like how she looks, it means that historical dresses (which rely on a specific silhouette) look off. As I drew these costumes, I realized I was going to a have to allow myself to be a little more liberal then my natural leaning for historical accuracy allows and, besides, I don’t really know enough about the 18th Century to be hyper critical of my own work. I won’t say these costumes are historically accurate, I will say they are historically inspired. Anyway, if you’d like to read more about 18th century costume, I recommend the excellent 18th Century Blog which is full of beautiful pictures and things, as well as, the exhibit Historic Threads. As for books, I used An Elegant Art, Seventeenth and Eighteenth-Century Fashion in Detail and, of course, Patterns of Fashion: Englishwomen’s Dresses & Their Construction, even if you never plan on sewing one of her patterns, this book is worth every penny just for the historical information. Someday, I will own all of Janet Arnold‘s books… Someday. 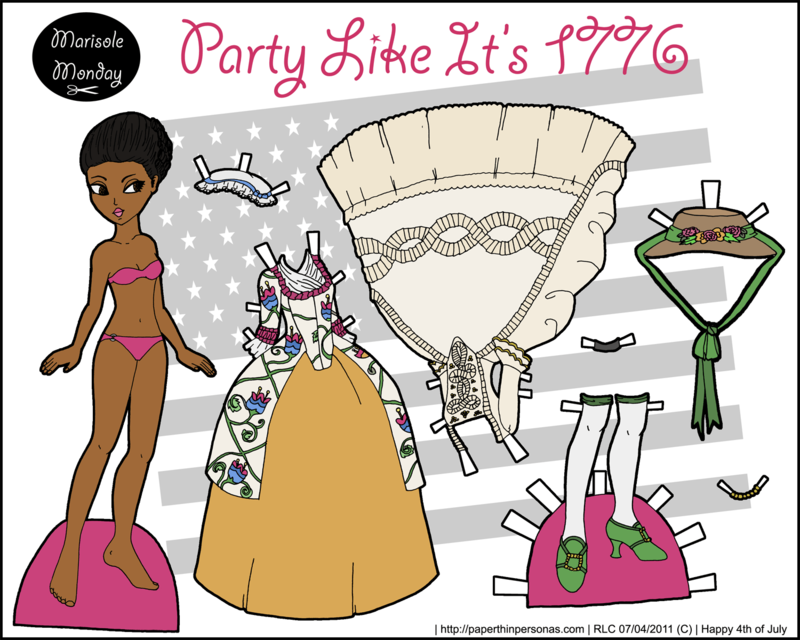 Enjoy the paper dolls and, for those in the United States, have a great 4th of July. Edit 8/23/13: One of these paper dolls is now available in black and white for coloring. These are so neat. I love the clothing from the 18th century. My favorite is the one with the orange skirt and the patterned top. Happy 4th of July! Thank you Josie. I’m so glad you like them. The orange and flowered dress is my favorite as well. For some reason, I think of those Barbie doll cakes whenever I see wide skirts like this. I don’t know why, I just seem to. :(? When I was a kid, I always wanted one of those barbie doll cakes… I think about that every-time I see one. So, I guess I feel your pain April. Wow… I do think you captured the essence of the mid to lat 1700’s with this. Drawing stays (or making them) is a challange. they are so “fitting” to the body. Love the look you achieved, Thank you.